"The most important career choice you'll make is who you marry." Today it's "At Last," the highest paid employee at a major corporation, Facebook, is a woman! Second in command, Sheryl Sandberg could become one of the wealthiest self-made women in the world once the company goes public. According to Claudine Zap at Yahoo Shine, "Her salary and stock awards last year were $30.87 million." According to Facebook's S-1 filing with the SEC on Wednesday, January 31st, Sandberg got $295,833 in salary plus a bonus of $85,133 and stock awards worth $30,491,613 which trumps the $1.49 million that CEO Mark Zuckerberg received (consisting of a salary of$483,333 plus a $220,500 bonus and “other compensation” worth $783,529). When Facebook goes public Sandberg will become a billionaire; Yet she admits that she can't succeed alone. "We need women at all levels, including the top, to change the dynamic, reshape the conversation, to make sure women's voices are heard and heeded, not overlooked and ignored." said Sandberg in a commencement address to Barnard College graduates. Well, personally speaking I had not heard much about Facebook COO, Sheryl Sandberg and it's the same with most of the people, and when it comes to the name of the creator of facebook it's always Mark Zuckerberg cause he has been always sticking around to the title of creator of facebook. Wow.. This is surely an exciting topic, the Facebook COO beating the CEO, and is a new news highlighter as well. She is an inspiration for all of us saying - "When There is a will, there is a way".. 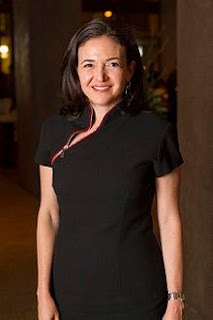 I had been digging the daily lifetime of Sheryl Sandberg and there are many causes and explanation why she got more success in the field of IT, Computer and Networking, she surely has got some great contribution of make Facebook a world wide success. Great, just look at the contribution she has made for the social networking giant Facebook, and she actually deserves to be placed topper than Mark, cause she has done every bit of her effort to make Facebook an outstanding place to communicate, share and socialize. Facebook is surely the most awesome thing that ever happened to internet. Nowadays, Facebook has been so so famous that when people think of this thing called "Internet" they only see Facebook as the whole global net and they are surprised by the fact that Internet is such a giant place, that it seems like never ending. This all is possible due to these guys - Sheryl, Mark and the whole crew and team of Facebook that has changed the whole meaning of Internet. I LOLed at her quote. Well, at least someone is being realistic about life although some might label her as materialistic. She’s one of the world most admirable woman who can actually inspire a lot of women out there and at the same time indirectly brings up the status and equality of women in the society. I am agreeing with Tina78 as I read the article too. We always teach our boys to be aggressive since young but we teach our girls to behave softly since they were born. We need to change our teaching as girls need to be ambitious too in order to excel in workforce. I WOWed at how much she made as the value is very near to Mark Zuckerberg’s salary. I don’t know if everyone else read her comment about how women lagging behind the men in business world. It is a really worth reading articles especially for women who are trying their luck in business now. Although men are good in business generally as how they are being taught since young but this woman is admirable as she did better than those men out there. She’s one in a million and I hope men will not start to lay back thinking that they are excelling women in business. I met a lot of successful women in business because they met successful husbands themselves. This shown that they were given chances because they have the networking or supports from men. If they not, they might not be as successful as they are now. I think men should really consider giving women more chances without looking at her networking. I think there’s wisdom in her speech about not undervalue yourself in your career. That’s important rule to not to let your employer to use you at the price that is not your worth.